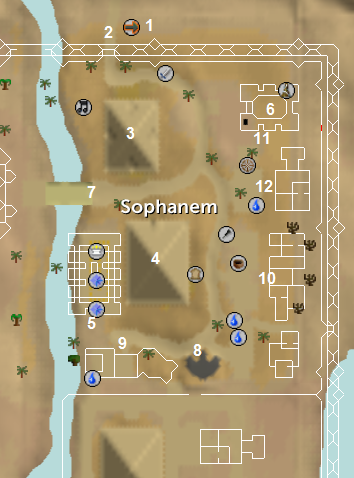 The city of Sophanem can be found at the far southern part of the Kharidian Desert, past the Shantay Pass and to the south. This city, although found in the middle of nowhere, has many attractions such as the quests: Icthlarin's Little Helper and Contact! and the Activity: Pyramid Plunder. Sophanem has its particularity in it though: everything is infected there! All the people have spots on them and the cows and the frogs are infected too! Like all other cities in the desert you do not need waterskins to survive here. There are many attractions in Sophanem including two pyramids, a temple for the lesser deities and another temple for the priests. Each has its uses. Note: You can only access this carpet ride after you have finished Icthlarin's Little Helper. 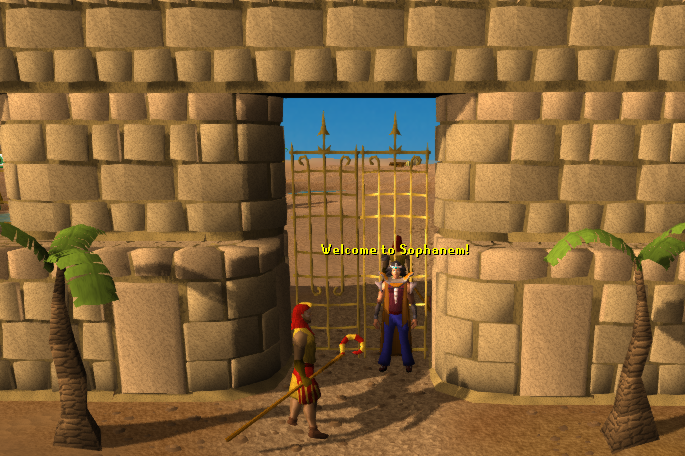 The entrance - which is just next to the rug merchant - to Sophanem is a big gate in a large brick wall. There are two priests guarding the entrance. Note: You can only open the gate after you have started Icthlarin's Little Helper. This pyramid is used for an Activity called Pyramid Plunder. 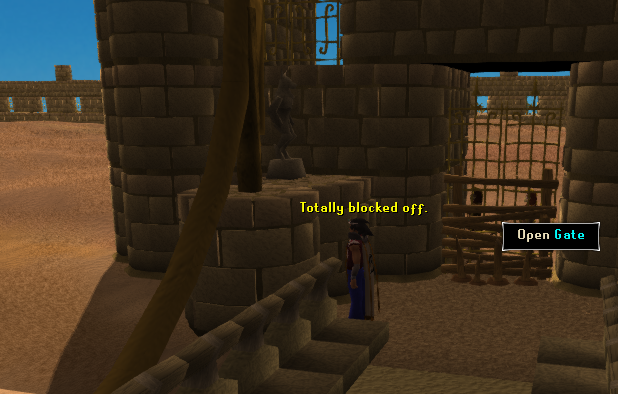 It is used for training thieving at a fast rate. 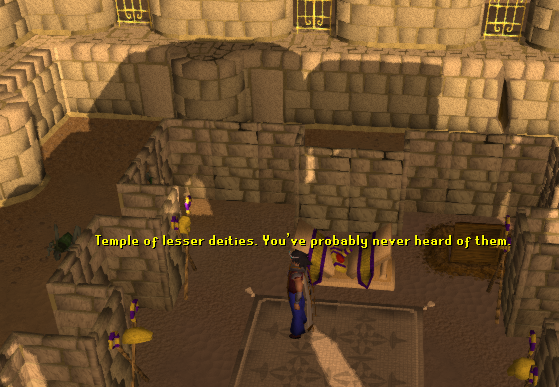 Please note that the higher your thieving level, the faster you will train. Do not attempt this Activity without having read this guide. To enter the Activity you will have to go in of the four doors. Three of the four lead to empty tombs and one of them has a mummy inside. Watch out, because if you fail opening the door that leads to the mummy, a bandaged hand will come and knock you out! Warning: This dungeon is highly dangerous, and you will lose your items if you die. Do not bring any valuables in here. Note: You cannot go in the pyramid without a kitten or a cat. After you have finished Icthlarin's Little Helper you should not have to go back in the dungeon again. To the west of the city is temple with many priests in it. At the top of it is a High Priest. He is important in the quest Ichthlarin's Little Helper and he starts Contact!. There is a ladder at the south of the temple which brings you up to the first floor with another ladder to the roof but there is nothing up there. There is also an altar on the ground floor where you can recharge your prayer near the high priest. At the north-east of the city is a temple. It is used in the Contact! quest. After you have started the quest you can go down the ladder to an underground dungeon. 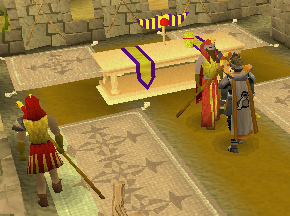 There is a bank (broken or fixed, depending if you finished the quest or not) and 2 sophanem guards there (with no spots!) who can sell you a torch for 200gp and a tinderbox for 50gp. From there you can enter the maze from a trapdoor. Again, there is a ladder to the second floor but there is nothing up there. You can cross this bridge to Menaphos but when you get there all you see is a big gate with two Menaphite Guards on the other side. It is used in Contact! in a cut-scene. 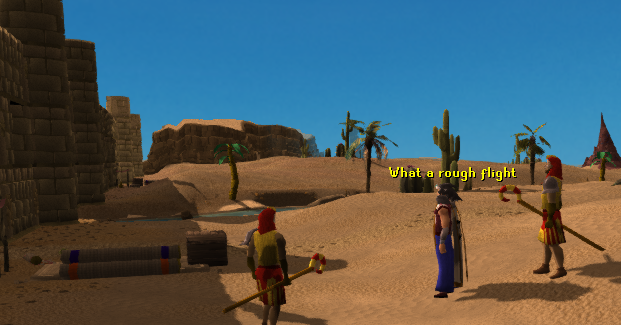 Later on, maybe Menaphos will open up and allow you to go in. At the south of town is a centerpiece used to make salt. To find out how to make salt, speak to the Embalmer. 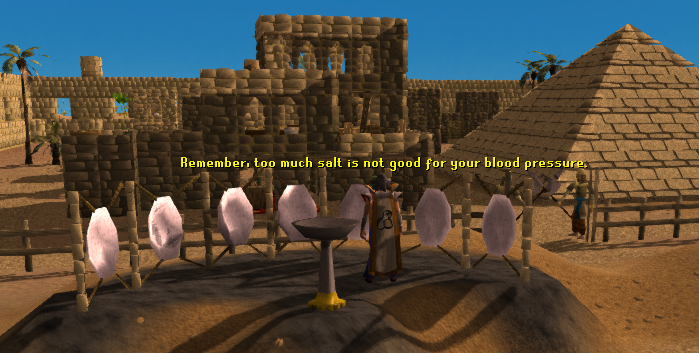 The embalmer will also buy all of your Buckets of Sap for 30gp each, and Salt for 20gp each. You can obtain Sap by using a Knife with an Evergreen Tree while carrying a bucket in your inventory. Use the bucket of salt with the centerpiece a the south-west of the city. Use a knife with an evergreen tree with a bucket in your inventory. There's a book called the Embalming Manual on the first floor up a ladder, which is used in the Icthlarin's Little Helper Quest. 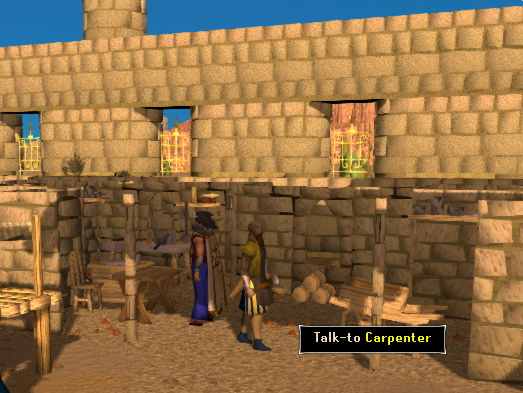 The Carpenter is a nice man in the east of town who will buy all of your Willow Logs for 40gp each. 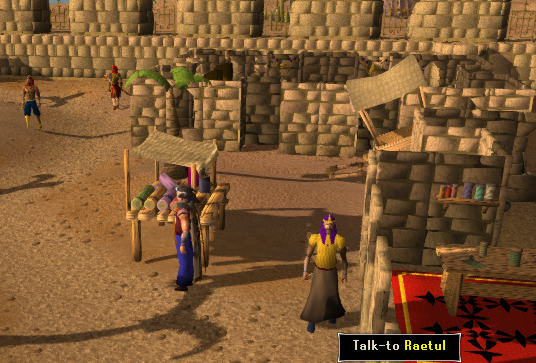 Raetul sells various supplies including fabrics, desert clothes and needles and threads. He was called the linen worker in the old days but Jagex has changed his name. These are the various people that you will find wandering around Sophanem. They are very unfriendly and just stare at you when you try to talk to them. They are all over town. They are situated in the priest temple with the high priest. You need a ghostspeak amulet to talk to him. He is south of the pyramid plunder Activity. 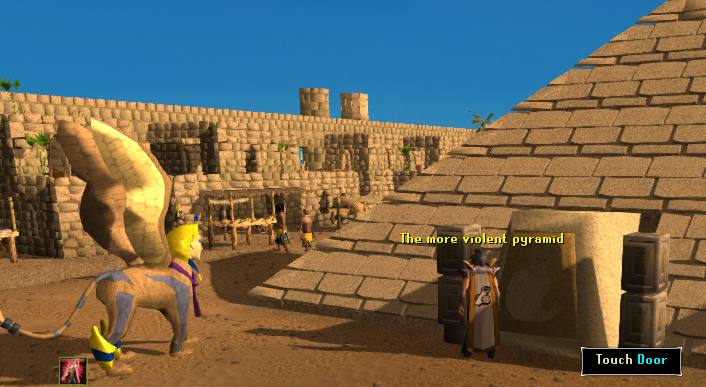 He talks about the pyramid plunder Activity and is south of it. 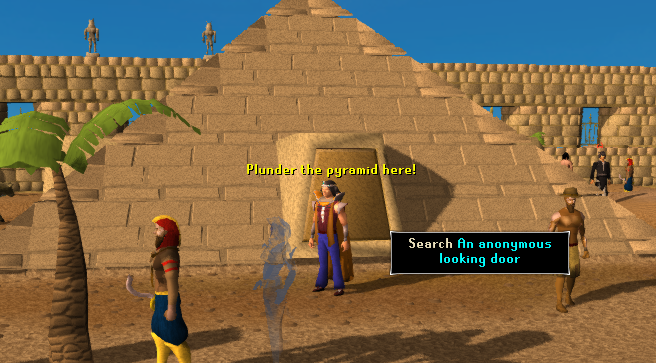 Talk to him to start the Pyramid Plunder Activity. He is situated inside the pyramid.